By now, everyone reading this site should be familiar with the main ways of earning miles. But today I was poking around the Krisflyer website while preparing for the upcoming Milelion-iPayMy webinar (sign up now, I guarantee I have a soothing baritone voice) and learned some very interesting things I’d like to share. Points expiry: 2 years from earning, if there is at least 1 purchase every 6 months. Otherwise 6 months. 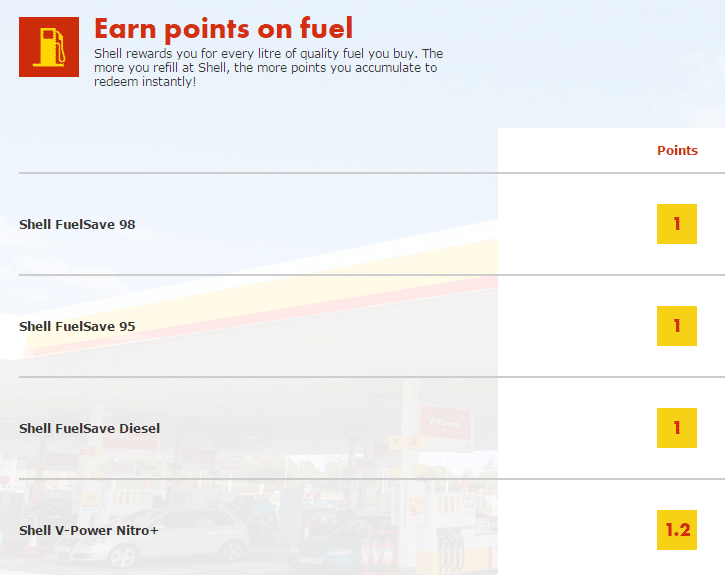 Shell ‘s rewards program is called Escape and awards about 1 point per litre of fuel you buy from them (as opposed to actual dollar spend, interesting…). Based on today’s undiscounted fuel price of $1.94 for 1 litre of FuelSave 95 (further discounts may apply when you pay with particular credit cards), you’re looking at earning about 0.3 miles per $1. That said, since points are awarded based on litres pumped, if you owned a Diesel vehicle you could potentially earn up to 0.47 miles per $1, based on the pre-discounted diesel price of $1.23 per litre. Smiles offers you two options- auto conversion and flexi conversion. Auto conversion means your Smiles points are automatically converted into Krisflyer miles as and when you accumulate a sufficient block (110 points in this case). Flexi conversion means you need to manually indicate when you want to convert. I’m a bit confused why auto conversion costs fewer Smiles points than Flexi. Presumably this is because there is less of an administrative burden on the Esso side to process multiple requests, but I would have thought that Esso might want to charge people for the “convenience” of automatic conversion. Petrol Watch Singapore tells me that Esso’s cheapest grade is now $2 a litre (again, factor in discounts with credit cards), so this means you could earn as much as 0.45 miles per $1. Diesel, on the other hand, is $1.25 a litre so you could hit 0.73 miles per $1. Diesel is such a great deal, isn’t it? It appears to me that Esso’s rewards program, at least from a miles earning point of view, is much more rewarding than Shell’s. SunPerks can be redeemed for Krisflyer miles at a ratio of 1,700 points to 750 miles. This is a rate of about 0.44 miles per $1. The annoying thing about the SunPerks program is (according to my reading of the T&C) all your points expire 2 years from your join date. Yes, your points will expire 2 years from your ‘join date’, which is the date you first entered the SunPerks programme. After this date, you will begin accumulating points from the start. If I’ve understood this right, it means that even if you earn points on the day before the end of your 2 year “cycle”, your points expire the next day. That’s just insane. Hopefully I’m wrong here but I don’t see any other reading of this clause. Fashion brand Club21 has a rewards program of its own. This doesn’t seem to be the easiest loyalty program to sign up for. In order to join the program you need to accumulate 1,000 Club21 points (the equivalent of S$500 of spending) over 3 months. Then, you need to send in your receipts to join. 5,000 Club21 points = 2,000 Krisflyer miles, so you need to spend $2,500 to get 2,000 Krisflyer miles, or 0.8 miles per $1. That’s actually not too bad, all things considered. The other thing about Club21’s loyalty program is that you can earn points around the world, making it the only program in this article that has that capability. Changi Rewards points earning depends on your tier. Basic members earn 1 point per $1. Gold earns 2, Platinum earns 3. You quality for Gold and Platinum with a minimum spend of $4,000 and $8,000 respectively within between April and March. I doubt anyone is going to splash that amount of money at the airport, so let’s assume for all intents and purposes $1= 1 point. Changi Rewards points can be converted at a rate of 600 points to 200 miles. So your earn rate is a rather poor $1=0.33 miles. You are allowed to convert a maximum of 30,000 Krisflyer miles a year, which is really not a a hard limit because that implies some unimaginably large spend. The program has a funny validity structure too. Like SunPerks, it seems the program “expires” at the end of each year, after which your points all expire regardless of when they were earned. The program year runs 1 April to 31 March of the next year. Don’t join the program towards the end of March, I suppose is the message here. And others too. Depending on whether you frequent such places, the discount might be worth the $10, 5 year membership fee alone. But there’s also a loyalty program. PAssion card earns TapforMore points. I’ve done the analysis on the math here but to summarise, you earn the equivalent of $1=0.43 miles at Cold Storage, Giant and Guardian. The upside of this, if you want to call it that, is that you are far more likely over the course of a year to spend more at these merchants than Club21, Changi Airport, M1 or any of the other programs mentioned above. So none of the above will exactly be a mile minting machine. I’d view them as more of a slow burn thing- over time you might accumulate enough points to cash out for a few miles, but it’s hardly going to be life changing. The general earning rate of about half a mile per $1 are the equivalent of about a 1-2% rebate (depending on how you value your miles). And remember to use cards like the CITI rewards or OCBC Titanium Rewards when shopping at Club 21! What i meant is the card validity is 24 months for base members and 36 months above the base tier. i assumed that your points expire when your card does. is that true? I’m not sure about that though. Probably need to check with them. But I suppose people who do shop there can usually renew their membership quite easily within two years. Lol. I earned around 3000 miles with tapformore over the last year. Not quite enough for a suites redemption, but better than nothing I suppose. HI Aaron, also AGODA. They have this new feature now. However, i think the hotel rates at AGODA is slightly higher than that of EXPEDIA.